Apparently I love the way some games convey a sense of space and physicality through touch, specifically animations of characters touching walls and other people or animals. If you trace the movement Lara's hands make in Tomb Raider, for example, you will find them tracing out patterns of interaction with her environment in really clever ways. Of course it makes sense for an adventure game based heavily on platforming to include tactile animations. Indeed, I have actually written about this "touchy subject" in regards to Prince of Persia and Ico, two games that melded game design and haptic sensations beautifully. I should say, not all games do. Most character movements in first-person games, almost necessarily, feel stiff and forced, failing to detail the world in their movement at all. Mirror's Edge is an obvious exception, but I might include Portal 2 in there, if for no other reason than the high-fives and teasing animations in its multiplayer component. The Mass Effect series, even though it's third-person, also feel clunky and unrealistic, as does Gears of War (although that's probably the point). Some 2-D games also create a sense of space or flesh out characters with touch. The way Super Meat Boy squashes down a bit when he lands from a jump is lovely touch. The same can be said for the way the ninja in Mark of the Ninja leans forward when walking, heavily and assuredly, as though stalking prey. These little touches, particularly when they meld with other design aspects, such as Lara's frantic dodge maneuver, can add depth to characters and a richness to the world. I always really liked in Half-Life 2 the way that Alyx would wipe her face with her hands after some particularly exciting moment. It was also just a nice touch that added a very human characteristic. As a side note: while playing Gears, my wife and I always thought the game was seriously lacking by not having a 'high-five' ability with your partner. A lost opportunity for more testosto-rage bromancing. Yes, a first-bump would have been appropriate. Which, by the way, means Army of Two deserves some credit. I have got to agree that Lara just moves so perfectly... 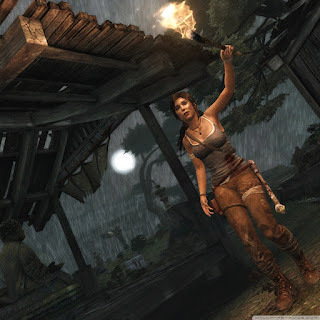 Which mostly works well, although when it does things wrong (when lara is putting her hand out to be against a wall, but there is a gap between her hand and the wall yet her palm is flat) it's a little more jarring than in other games, precisely because she usually is so perfect. Although I'm surprised you didn't leap to the voice acting first actually. But yeah, hope to hear a lot more from you guys about it as TR has been the biggest surprise I've had with how good a game is in a very very long time. I'm not sure if I'm settled on the voice acting, but you're right about animation errors. When her arm is going through a rock or she stands up while sliding around, it all comes off pretty weird. Which could be an argument for the scripted melee attacks they do. You know, I actually do think the hair is pretty great. Wowza, TressFX is some serious hair tech. Lara's lovely locks are not done justice on the PS3! "more realistic yetis, real-time beard physics"
TressFX, you have your priorities straight! Bring on those long-bearded wizards and dwarves and let the wind blow through them! Grand Theft Mammoth. You heard it here first folks. Well, I'm unsure about the rest of cast, I'm thinking just Lara here. Then again, maybe there is a dip in quality as I'm only about... 4 hours into the game. This blog provide exceptional and helpful information for which I was searching..